The Queensland Museum Network has a long and proud history of loaning resources for educational purposes. Queensland Museum Loans is Australia’s largest and most diverse museum lending service. Each year, our education staff develop new object-based learning resources aligned to the Australian Curriculum. 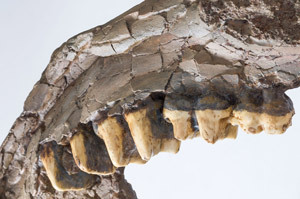 The Finding Megafauna kits, developed with support from BHP Billiton Mitsui Coal.The Finding Megafauna learning resource kits unravel some of the mysteries of our prehistoric past. 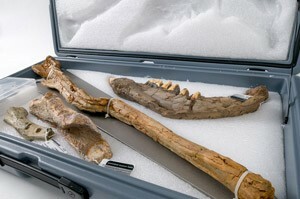 Developed with generous support from BHP Billiton Mitsui Coal (BMC) as part of the award-winning Megafauna in Queensland partnership Finding Megafauna kits feature replica megafauna fossils with comparative contemporary crocodile and kangaroo bones and tools used in paleontological and archaeological digs. 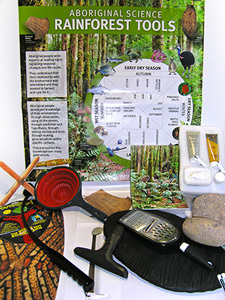 These items are complemented by profiles of Queensland Museum Network palaeontologists, BMC staff and Traditional Owners of the land, providing a real-life example of the collaborative nature of mining and the way scientific inquiry and analysis is used to identify fossils and understand the way our environment has changed over time. The Aboriginal Science kits, developed with support from South32Aboriginal people have lived in Australia for thousands of years, and during this time they have developed unique, sophisticated survival technologies. The boomerang, for example, is a highly specialised instrument that harnesses the complex laws of physics, allowing Aboriginal people to hunt much more effectively. Support from South32 allowed the development of a two new loan kits examining the sophisticated science that underpins Aboriginal culture. Aboriginal Science: Rainforest explores the mastery of science by Aboriginal people in rainforest areas in north-eastern Queensland, while Aboriginal Technology & Trade explores traditional Aboriginal trade routes and shows how the value of natural resources changes when resources are not available locally.